Widespread throughout Africa, from Egypt to South Africa. Most often seen in large lakes and rivers, including Tanganyika. 42″ (105cm) although it is unlikely to achieve this in captivity. A size of 30″ (75cm) is easily attainable however. 120″ x 36″ x 36″ (300x90x90cm) – 2400 litres. Even an aquarium this size is too small for an adult specimen. There is no need for any decor except perhaps a sandy base due to the speed and power of these fish. Water should be of the highest quality and well-oxygenated. 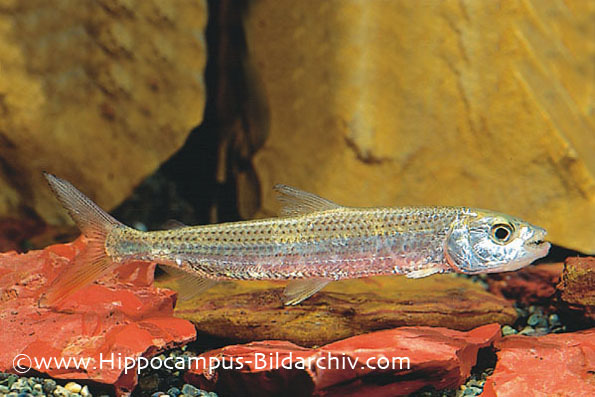 It is a piscivore by nature and many sources state that it will only feed on live fish. This is not true and it can be weaned onto whitebait and other dead foods fairly easily. Should really only be kept alone or with other similarly sized members of the same species. There are reports of it being kept with Loricariids, cichlids etc. but these are usually young fish being kept with larger tankmates. Anything smaller than the tiger fish may be ripped to pieces without prior warning. Has been bred in aquaria but little to no information exists. A truly enormous aquarium would be required for any serious breeding attempt. A voracious piscivore that hunts in large shoals in the wild, this species is perfectly designed for its lifestyle. It is very streamlined and muscular and has one of the most amazing sets of teeth of any freshwater fish. These are dagger-shaped and interlock, meaning the fish can rip chunks out of its prey. The teeth are visible even when the animal’s mouth is closed, which makes for a fearsome sight. It is a popular game fish in its native range, with the largest specimen caught weighing in at 28 kg (62 pounds). We cannot stress strongly enough that this is a species totally unsuited to aquarium life. Alarmingly, it is becoming easier to acquire, with small specimens showing up quite frequently in dealer’s tanks over the last few years. When small, it makes an interesting and undeniably impressive addition to a large aquarium but bearing in mind its massive adult size and the potential dangers associated with the maintenance of such a fearsome predator we recommend it is avoided.